With all the press Ethos Marketing has been receiving about the Blogging the Barrens campaign they created for the Wild Blueberry Association of North America (WBANA), (check out the Maine Sunday Telegram), we thought it was the perfect time to share how VONT redesigned the WBANA website this summer. Our goal for the redesign was two-fold: simplify the navigation of the existing site, and highlight (read “make abundantly clear”) the difference between wild blueberries and cultivated ones. Because the amount of information on the old WBANA site was tremendous, and the navigation unwieldy – requiring a three-step process to find most information – users frequently found themselves lost in the sheer volume of information available to them. To simplify the experience, Tim Blackstone, VONT’s Digital Creative Director, completely redesigned the way users move around the site. The result? The new navigation is simple, intuitive and elegant. The amount of information on the site is still tremendous, but it is now readily available and easy to locate. The recipe channel also benefited from customization. The channel uses two sizes of the same photograph to illustrate each recipe: a smaller version appears on the recipe landing page, while a larger version highlights the individual recipe page. Because the two sizes are easily accessed behind the scenes from the same page, VONT had the flexibility to design for and improve the viewer experience. 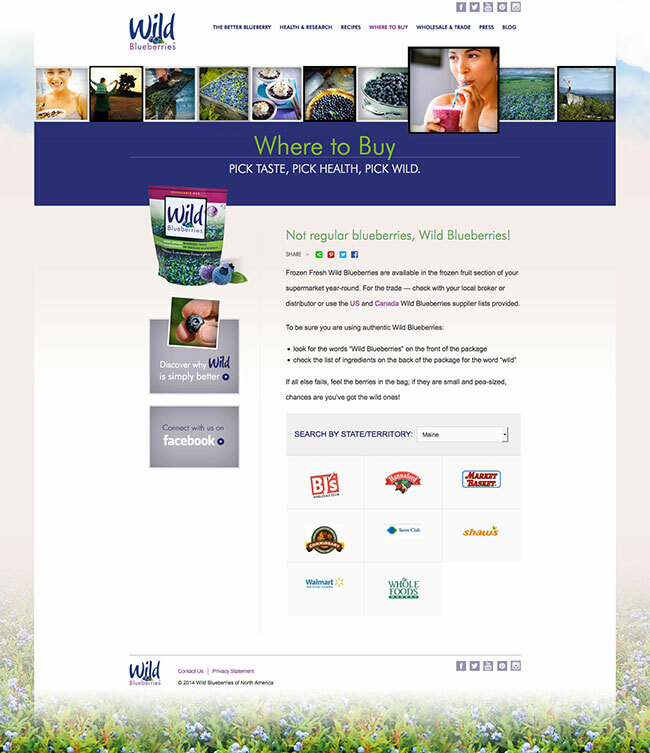 In addition to the recipe and Where to Buy sections, custom content management and display tools were used for promotions, slides, news about Wild Blueberries, and WBANA in the news. These custom options benefit user experience, and make the site easier to maintain on an ongoing basis…which in turn extends the life of the quality user experience down the road. With the backbone of the site in place, VONT turned its attention to highlighting WBANA’s primary message: While Wild Blueberries may be smaller, they have better taste and more antioxidant power than cultivated blues. In order to present consistent brand messaging, VONT worked with Ethos to make sure that the same ideas, phrases, and wording would be used across marketing channels. As a result the look, the feel, the message on all WBANA platforms is consistent. 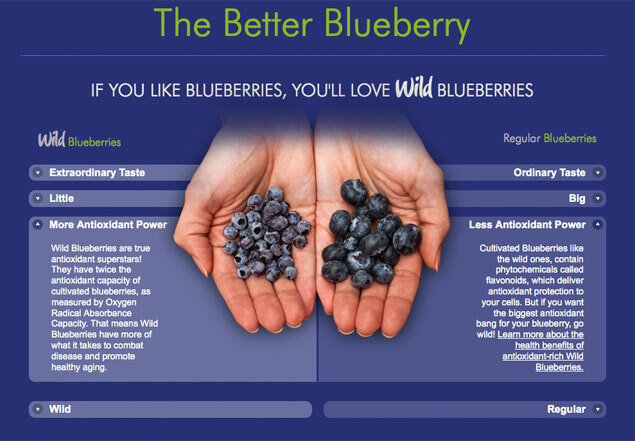 The message appears throughout the site and is highlighted visually on the Better Blueberry page, which uses a photograph of both types of berries and drop-down copy to illustrate the side-by-side comparison of Wild Blueberries vs. Regular. Perhaps somewhat unexpectedly, the VONT crew found themselves becoming wild blueberry aficionados choosing wild over cultivated in their own shopping. Here’s VONT President Tom Gale’s favorite blueberry smoothie recipe from WBANA. Think Wild and Enjoy! Blend well at high speed. Serve immediately. Wild Blueberry Smoothie serves 2. If you’re interested in testing out more great wild blueberry smoothie recipes, simply visit the Blueberry Smoothie Recipes page at WBANA.